Canon are replacing their aged 60" line up with two new models, the Canon iPF9400 and the Canon iPF9400S. These two new imagePROGRAF printers are well overdue and replace the iPF9100 and iPF9000S respectively. 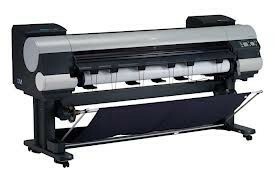 featuring improved scratch resistance, facilitating the finishing and movement of output, once printing has completed. Additional colour improvements include improved colour management and calibration systems and “hot swap” ink cartridge technology across all devices brings increased productivity & reduces the total cost of ownership. The Calibration Management Console (CCMC) software means that users can calibrate one machine & then replicate the results to their entire fleet (should they have multiple units). Canon have also utilised optical technology from their camera manufacturing to enhance the colour Density Sensor. • LUCIA EX 8 colour pigment ink system, which enables the 60-inch large-format printer to cover a colour gamut that has been expanded approximately 20%. • Producing deeper dark tones, the device is able to output vivid photographs, high-precision text & line reproduction. • Canon iPF9400S is approximately 1.5 times faster than the old iPF9000S. • In addition to both 330ml ink tanks & 700ml large-volume ink tanks, the iPF9400S includes ink sub-tanks to ensure a continuous ink supply and enables ink tanks to be "hot swapped" without interrupting print jobs. • The iPF9400S enjoys a variety of improvements on the functionality of the product, such as Accounting Manager (to show the cost of each and every job), a simplified front control panel and more advanced media management tools.